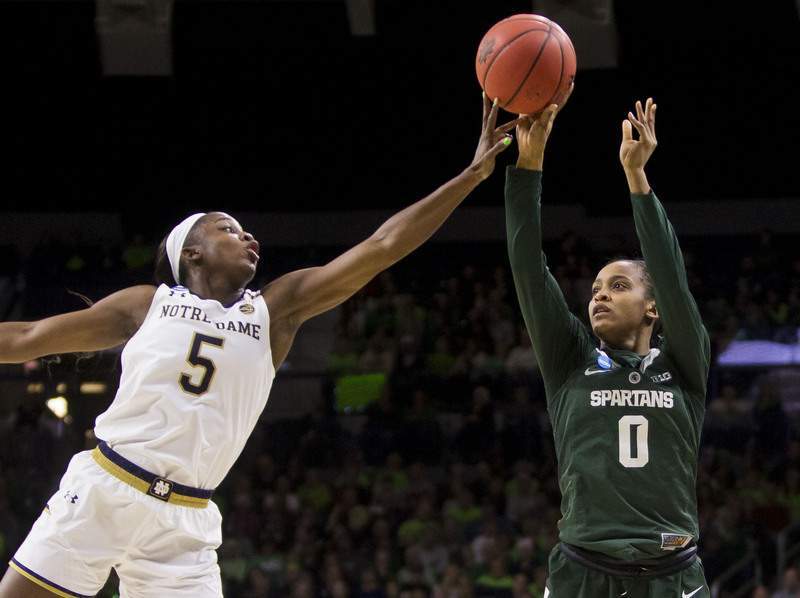 Associated Press photos Notre Dame’s Jackie Young blocks a shot by Michigan State’s Shay Colley during Monday’s NCAA Tournament game in South Bend. Young had 21 points, 11 rebounds and sevens assists for the Irish. 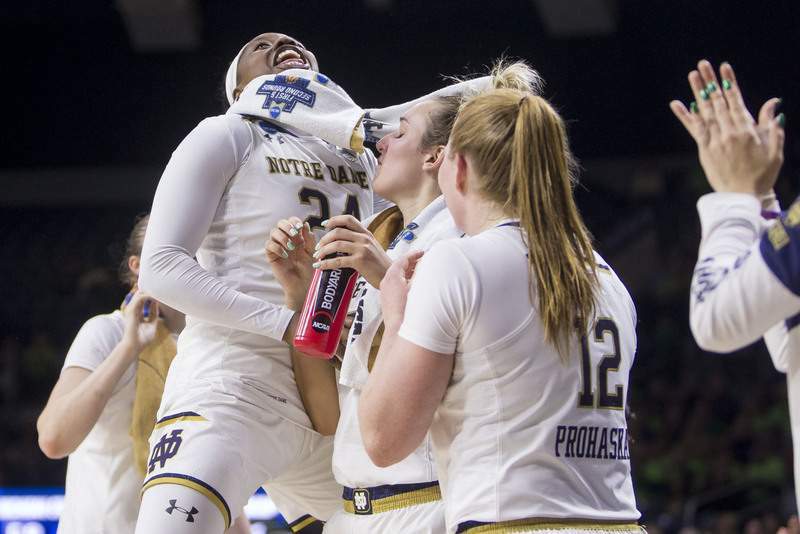 Notre Dame's Arike Ogunbowale celebrates with teammates Monday. Ogunbowale finished with 23 points. SOUTH BEND – Notre Dame has been one of the last 16 teams alive for the national championship every year for the last decade. The Irish women's basketball team reached the Sweet 16 for the 10th consecutive season Monday behind 23 points from Arike Ogunbowale and 21 points, 11 rebounds and seven assists from Jackie Young. Their performances propelled No. 1 seed Notre Dame to an easy 91-63 victory over No. 9 seed Michigan State in front of an announced crowd of 6,694 at Purcell Pavilion. McGraw has reached the Sweet 16 16 times in her tenure with the Irish. This time, Notre Dame (32-3), winners of 11 in a row, will face No. 4 seed Texas A&M (26-7) at Wintrust Arena in Chicago. The Irish took control of Monday's game with a monster 19-1 run midway through the second quarter that ballooned a nine-point lead to 27. Jessica Shepard scored six of her 19 points during the stretch, and Ogunbowale added a couple of pull-up jumpers after she had beaten her defender off the dribble. Rebounding was a problem all night for the Spartans. Michigan State center Jenna Allen lamented that “we couldn't keep them off the boards” and the Irish racked up a 49-37 edge on the glass. Young turned in 11 of those rebounds, and Brianna Turner matched her with 11, as well as 14 points for the senior's ninth double-double of the season. Turner's big night on the glass pushed her over 1,000 rebounds for her career and past Ruth Riley for the top spot on Notre Dame's all-time rebounding list. Turner reminisced after the game about facing a recently retired Riley in practice as a freshman and said the Irish legend has always been quick to help in any way possible. The Irish led 52-26 at halftime and coasted to a victory in the second half. Ogunbowale put the game away with a long 3-pointer in the third quarter that put Notre Dame up 32 and drew an extended ovation from the crowd. The second-round victory over the Spartans (21-12) doubled as the final home game for a successful senior class that includes Turner, Ogunbowale, Shepard and Marina Mabrey. Turner took some time to thank the Irish fans for their support after the game.